There are more dynamics in the painting than my digital camera was able to read; but that's kind of normal. This is a problem that often brings me much frustration. Oregon pastel painting on 9" x 12" Bristol board, painted in layers using SpectraFix. 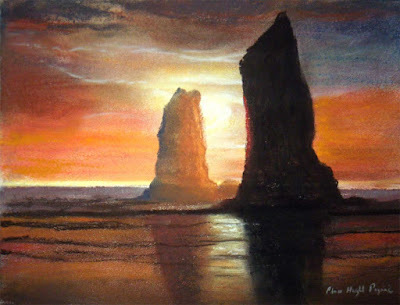 I'm reading: The Needles Cannon Beach Oregon Pastel PaintingTweet this!